The GS-H5 bottom coil clearomizer is that the older brother to the GS-H2. It has a tank capacity of 3ml which gives you ample vaping between refills. This clearomizer has all the bang for not so much buck. Similar to the GS-H2, this is a bottom coil clearomizer. This means that when your coils are burned out, just unscrew it and replace it with a new one. Easy as that. This clearomizer is also 510 threaded. This means it will fit on any eGo battery. It has a one piece design, the mouthpiece and tank are all one piece. This means little to no leaking from the top and no messes when refilling. It also comes in a plethora of colors. The H5 is a fantastic addition to the K101 mechanical mod kits. Not only does it come in colors that are complimentary to each other, the size of this clearomizer makes the overall look streamlined and modern. You'll wow your friends and impress your co-workers when you bring out this all around great MOD and its smooth sidekick, the H5. The all metal construction and chrome finish with color accents makes the K-101 mechanical mod kit a real eye-catcher. The K101 has a 510 / eGo threading for use with almost any atomizer, clearomizer or cartomizer with 510 or eGo threading. The K-101 MOD from Kamry is a telescoping mechanical mod. The telescoping feature lets you use the 18350, 18490/18500 and 18650 sized batteries. At the top of the battery tube, bottom of the battery tube, and also in the switch assembly there is a safety vent. Along with these great features, the switch assembly features a reverse threaded locking ring that prevents the accidental unscrewing of the switch when it is in the locked position. Unscrew the bottom of the MOD above the ON/OFF switch. Insert battery (size of your choice) ( + ) side up. Place The Kick on the ( - ) end of the battery, magnet facing the battery. Replace the bottom of the Mod. Twist the colored part of the MOD until it feels snug (but not tight). Screw on the clearomizer of your choice filled with liquid. To use, make sure the ON/OFF locking ring is turned all the way to the left. Then press the button on the bottom of the MOD, holding it in while inhaling. Be careful when storing Mechanical Mods, we recommend removing the battery and storing the battery in a Battery Case or other container. Do not over-discharge/overcharge - Recharge empty batteries (resting voltage ~3.6V) as soon as possible. Leaving batteries in discharged state can/will cause irreversible damage not covered by a warrantee. Don’t leave batteries in Vehicles. Don’t carry batteries loose in your pockets, purse or anywhere they can make contact with other metal objects. Don’t leave batteries alone while charging. Stop using a battery if it looks like its worn, the outer wrapping is torn, or it's acting differently than usual. Avoid over tightening, when screwing together the device. Make sure that you’re only screwing the battery cover tightly enough to the point where the battery doesn’t rattle around. Over tightening of the Mechanical Mod may cause the unit to continuously fire unintentionally and could damage the battery or internal components. Screw the button clockwise (to the right) to unlock. Screw the button counter clockwise (to the left) to lock. This unit is completely mechanical which means it doesn’t have any built in protection circuitry. Please be careful when using this product. 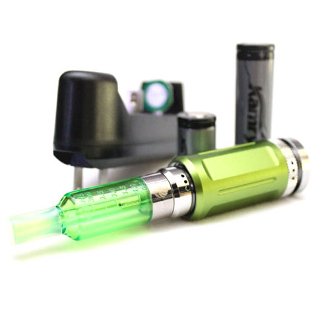 The K101 is able to use a Kick chip with 18350 or 18490/18500 batteries only. We will not be liable for any damage to Clearomizers, cartomizers, batteries etc. A kick chip can protect the battery from short circuit. It also can avoid the overheating of the batteries and provides overcurrent protection.